"Learning Western Techniques of Empire: Republican China and the New Legal Framework for Managing Tibet"
Abstract: At the end of the nineteenth century, China found itself torn between its imperial past and its nation-state future. By the time it became a Republic in 1911, China had to redefine its territory in new national sovereign terms. Until then its territory had been inscribed in more malleable frontiers and boundaries within the normative framework of the so-called ‘tribute system’. The article shows how, applying the new legal techniques of empire learned from the West, the Chinese central government, wherever possible, attempted to expand its new sovereign domain in territories like Tibet, Xinjiang, and Mongolia, where, according to international law, all the prerequisites existed for national self-determination and independence. In the context of opposing British and Tibetan claims, the Chinese appropriation of international law in the Republican period (1911–1949) helped China not only to assert itself in the international domain as a sovereign state, defending itself against Western imperialism, but also to pursue its own fictional imperial claims over Tibet, without which the Communists’ ‘liberation’ of Tibet would have not been possible. 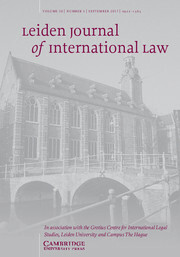 The paper highlights the interplay of imperial techniques based on international law, the relativity of this legal language, and how the strategies of empire are not only a prerogative of the West, but can be quickly adopted by those who have been subjected to them, resulting in a vicious circle.